Shandwick Beach - Easy parking (free) popular with surfers. Try the coastal walk from Nigg to Rockfield, approx 10 miles. Portmahomack Beach – Easy parking with spectacular views across the Dornoch Firth. Dornoch Beach – Easy parking next to the Royal Dornoch Golf Course again enjoying spectacular views across the Dornoch Firth. 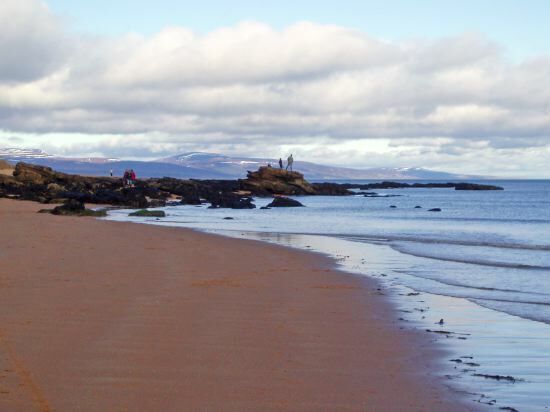 Embo Beach – A few miles up the coast from Dornoch, again with easy free parking. The many quiet roads in the area and the relatively flat geography make Easter Ross an ideal location for cycling. The Forestry Commission has created a substantial network of cycle tracks in the Highlands, many of which are suitable for the more discerning mountain bikers. There are a number of popular distilleries in the immediate area and they are well worth a visit, providing you with a terrific introduction in to the process of whisky-making and an opportunity to sample some of the finest malts Scotland has to offer. Falls of Shin – 30 minute drive to see the famous Falls of Shin Salmon leap & Visitor Centre with Mr. Al Fayed’s Waxwork and some Harrods shopping to boot! Dunrobin Castle and Gardens – Truly wonderful displays of paintings and furniture and of course the formal gardens, a few miles from Golspie on the main A9. Hugh Miller Museum & Birthplace Cottage – Hugh Miler eminent geologist, writer and editor was born here in 1802. Black Isle Brewery – On the Black Isle brewing some fine beer and well worth a visit.